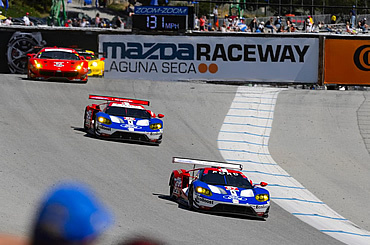 SALINAS, CA, May 1, 2016 – History was made at Laguna Seca Raceway as the all-new Ford GT earned its first competitive win today, thanks to the fuel economy of the Ford EcoBoost engine and commanding drives by co-drivers Ryan Briscoe and Richard Westbrook. The duo started the two-hour race on the front row in the second qualifying position, but it wasn’t long before it became clear the race would be won by the team with the best fuel economy. That was the No. 67 Ford GT. The No. 67 Ford GT was able to cruise to the victory on the back of only one pit stop, while the rest of the competitors took two or three. The team’s sister car, the No. 66 Ford GT, finished p6. The mood on pit lane was jubilant as it became apparent the team would top the podium less than a year since the first Ford GT race car turned a wheel. “What a day for Ford! To get the first win with our new Ford GT at Laguna Seca and to win the NASCAR Sprint Cup race with Brad Keselowski at Talladega says a lot about the quality of our race teams and the hard work our Ford Performance engineers have been doing.” said Raj Nair, executive vice president of Ford Global Product Development, and chief technical officer. “We have been making great progress with the Ford GT program and this weekend was big in terms of showing reliability, speed, but also amazing fuel economy. We couldn't be happier for all the Ford, Multimatic and Ganassi team members who have spent endless hours getting us to this point. It's been less than a year that the race car first turned a wheel in testing, so it's a great morale boost to everyone as we now get ready for Le Mans. Congratulations also to Brad, Team Penske and also Roush Yates Engines who built the Ford engines for both wins!" Both Ford GTs showed promise in practice, making the top four in each session.